Did John Calvin Make God a Liar? “Portrait of Young John Calvin”, Bibliothèque de Genève (image source). Last time, we examined a common Young-earth creationist claim: if the earth is billions of years old, then God is a liar. That is just one specific instance of the general YEC tendency to dismiss other views with accusations of a “lying” God. In many cases, that approach glosses over legitimate questions about interpreting biblical references to nature that arise naturally from the text. Many such passages were discussed by great theologians long before the acceptance of long ages in the history of nature, when virtually all Christian scholars believed in a “young” earth, and we find a considerable range of interpretive opinion among them. Some of the most instructive examples come from the greatest theologian of the sixteenth century, John Calvin. For millennia, Christian scholars have held various other ideas about the waters. For example, Basil of Caesarea, one of the greatest Patristic theologians, devoted significant attention to this question in his third homily on Genesis. Basil believed that Genesis 1:1 (“In the beginning God created the heaven and the earth”) teaches that God made “the heaven” first, and that the “heaven” mentioned on day two must be another heaven containing the stars. Thus, the “waters above the firmament” must be above the starry heaven but beneath the original heaven, making three separate entities above the spherical earth, consistent with Paul’s reference to a man who was carried up into the “third heaven” (2 Cor. 12:2). 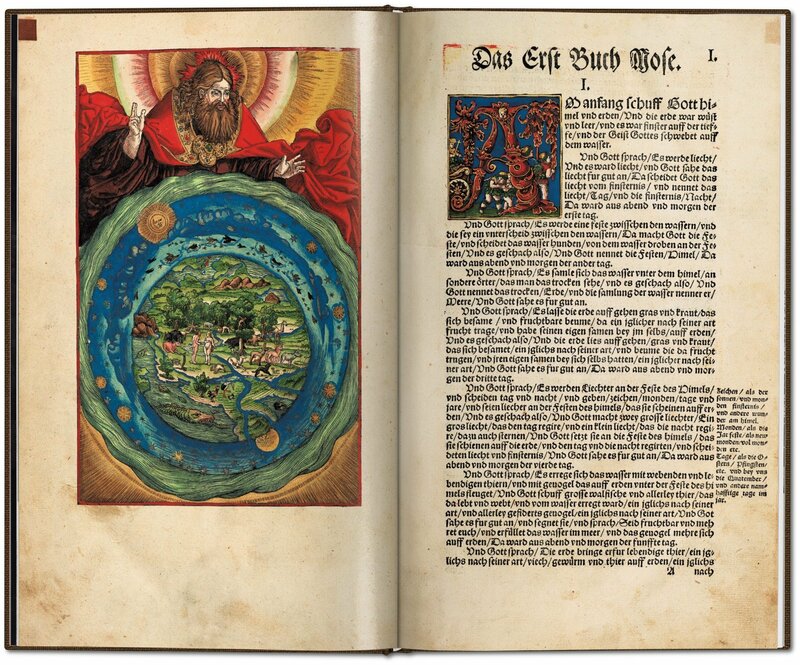 This contradicted Aristotle’s teaching of the existence of just one heaven (containing the stars), but Basil went with the Bible alone, refusing to follow earlier commentators who had interpreted the waters allegorically. Moses describes the special use of this expanse [firmament], to divide the waters from the waters—from which word arises a great difficulty. For it appears opposed to common sense, and quite incredible, that there should be waters above the heaven. Hence, some [authors] resort to allegory, and philosophize concerning angels; but [this is] quite beside the purpose. For, to my mind, this is a certain principle: nothing is treated of here, except the visible form of the world. He who would learn astronomy and other recondite arts, let him go elsewhere. Here the Spirit of God would teach all men without exception; and therefore what [Pope] Gregory declares falsely and in vain respecting statues and pictures is truly applicable to the history of the creation, namely, that it is the book of the unlearned. The things, therefore, which he relates, serve as the garniture of that theater which he places before our eyes. Whence I conclude, that the “waters” here meant are such as the rude and unlearned may perceive. The assertion of some, that they embrace by faith what they have read concerning the waters above the heavens, notwithstanding their ignorance respecting them, is not in accordance with the design of Moses. In other words, don’t look for scientifically accurate descriptions of nature in Genesis—Moses wrote to an ignorant audience for other purposes. I gather that Henry Morris would not have agreed with Calvin’s attitude. In other words, Moses appealed to the understanding of the ordinary, unlearned person, and did not concern himself with scientific accuracy—which would only confuse his audience. In each instance, notice how Calvin tries to understand a biblical text in light of the best knowledge of his day, and how sensitive he is to the problems facing interpreters in post-biblical times, in cases when our understanding of nature has changed. He understood that biblical passages were written by ancient authors (such as Moses and David), writing to an ancient audience under divine inspiration. He knew that they got some scientific details wrong—and that this was beside the point. What exactly did Seely say to draw Holding’s ire? In a second part of his article (cited below), Seely wrote, “We need simply to see with Warfield that divine inspiration does not bestow omniscience, and hence God has sometimes allowed his inspired penmen to advert to the scientific concepts of their own day.” Holding disagreed, saying, “Seely confuses adaptation to human finitude with accommodation to human error — the former does not entail the latter.” Fair enough, but if he’s going to castigate Seely for thinking that the divine author of Scripture sometimes accommodates to human error, then he should also castigate Calvin for doing exactly the same thing! I wonder if AiG’s audience would approve of such a rhetorical strategy. Holding’s concerns about how “accommodation” is used are not entirely wrong—it all depends on making appropriate use of what we know from non-biblical sources. As I often tell my students, the principle of accommodation does not come with a built-in “OFF” switch. Like any other tool in the hermeneutical box, it needs to be applied carefully, not just invoked uncritically to justify any conclusion one wishes to draw. In my opinion as an historian of Christianity and science who has studied a great many examples of Christian writers employing accommodation, Seely applied it very carefully. So did Calvin. They both concluded that God sometimes accommodates to human error. Was Calvin also more dangerous to Christians than atheists? I have slightly edited the selection, including the punctuation, for modern readers. This is yet one more example of a YEC author demonizing legitimate differences of opinion about how to interpret a biblical text, a phenomenon that concerns me greatly, especially because it drives young Christians entirely out of their faith when they decide that the creationist box is just too small to hold the truth. My treatment of Calvin is based closely on Religion and the Rise of Modern Science (1972), by the late Reijer Hooykaas, pp. 117-122. For expert analysis of Basil’s understanding of the “waters above the firmament,” see David C. Lindberg, “Science and the Early Christian Church,” Isis 74 (1983): 509-530; the same material is also found in “Science and the Early Church,” in God and Nature (1986), ed. Lindberg and Ronald L. Numbers, pp. 19-48. A crucial text is Paul H. Seely, “The Firmament and the Water above. Part I: The Meaning of Raqiya‘ in Gen. 1:6-8,” Westminster Theological Journal 53 (1991): 227–240, and “The Firmament and the Water above. Part II: The Meaning of ‘The Water above the Firmament’ in Gen. 1:6–8,” Westminster Theological Journal 54 (1992): 31–46. The second part of Seely’s article (which Holding quotes) is not freely available in electronic form.